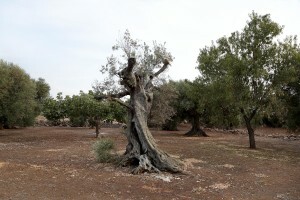 Scientists estimate that one million olive trees in Puglia are infected with the Xylella fastidiosa, a bacterium who contributed to a 35 percent drop in the region's olive oil production last year. The bacterial outbreak, probably arrived in Italy with plants imported from Costa Rica and which has destroyed citrus trees in Brazil and vineyards in California, poses a new danger for all of European agriculture. The bacteria Xylella fastidiosa is spread by insects and can also attack vineyards and citrus trees. 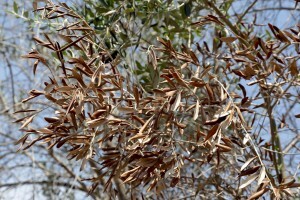 Xylella is one of the biggest disease threats to plants worldwide. 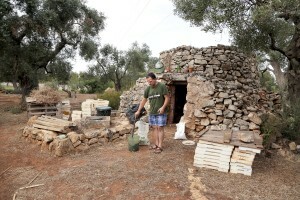 There is no effective treatment for infected plants while the only solution is to destroy them and establish Xylella-free buffer zones around them. 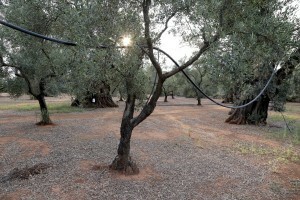 A combination of drought and disease in Spain and Italy pushed the price of olive oil up 10 percent. Analysts are expecting prices to remain high in coming months as demand is increasing. 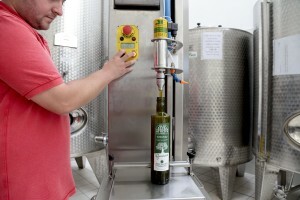 Retailers and distributors wanted to buy 12 percent more olive oil than exporters were able to deliver last month. August 11, 2015 – Specchia, Italy: Olive tree shows signs of infection by Xylella fastidiosa. 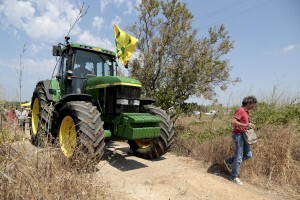 August 10, 2015 – Alezio, Italy: A protest of Salento farmers to ask measures to reduce the xylella emergency and continue to be among the excellence of the oil production in Italy. 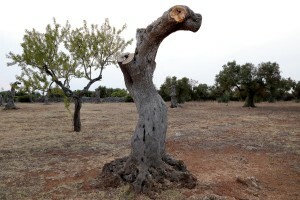 August 10, 2015 – Racale, Italy: Olive trees show signs of infection by Xylella fastidiosa. 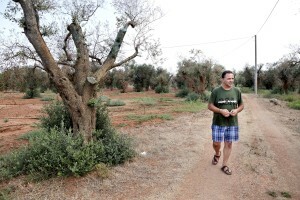 August 10, 2015 – Racale, Italy: Federico Manni, member of the Agricultural Society Cooperative “Acli Racale” is portrayed in an olive grove where trees show signs of infection by Xylella fastidiosa. August 10, 2015 – Felline, Italy: Olive trees show signs of infection by Xylella fastidiosa. 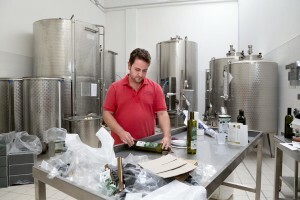 August 10, 2015 – Racale, Italy: Federico Manni, member of the Agricultural Society Cooperative “Acli Racale”, bottles olive oil. 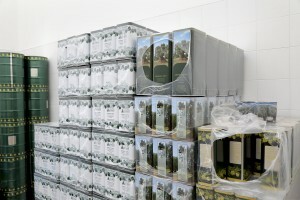 August 10, 2015 – Racale, Italy: Oil cans are seen inside the Agricultural Society Cooperative “Acli Racale”. August 10, 2015 – Racale, Italy: A farmer working in his field where olive trees show signs of infection by Xylella fastidiosa. 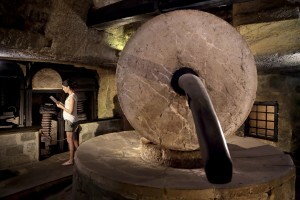 August 11, 2015 – Gallipoli, Italy: A tourist visits the historical underground oil mill of Granafei palace. 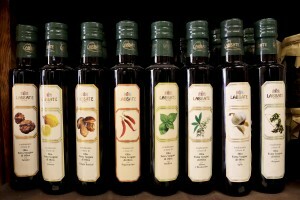 August 11, 2015 – Gallipoli, Italy: Oil Bottles for sale in a shop of typical products of Puglia. 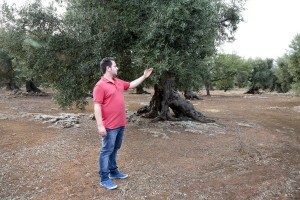 August 11, 2015 – Li Sauli, Italy: The grower Ivano Gioffreda is portrayed in an olive grove where trees show signs of infection by Xylella fastidiosa. 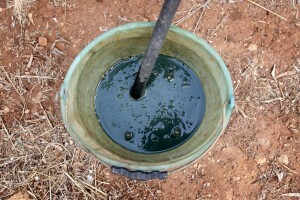 Gioffreda is testing from about one year a mix of lime and copper sulfate to treat Xylella. August 10, 2015 – Lido Pizzo, Italy: Olive trees show signs of infection by Xylella fastidiosa. August 11, 2015 – Sannicola, Italy: The grower Ivano Gioffreda testing a mix of lime and copper sulfate to treat Xylella. August 11, 2015 – Sannicola, Italy: A mix of lime and copper sulfate to treat Xylella. 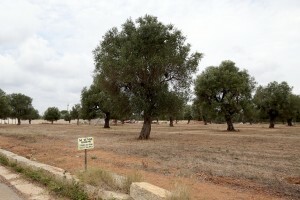 August 11, 2015 – Specchia, Italy: An olive grove for sale after the release of infection by Xylella fastidiosa.